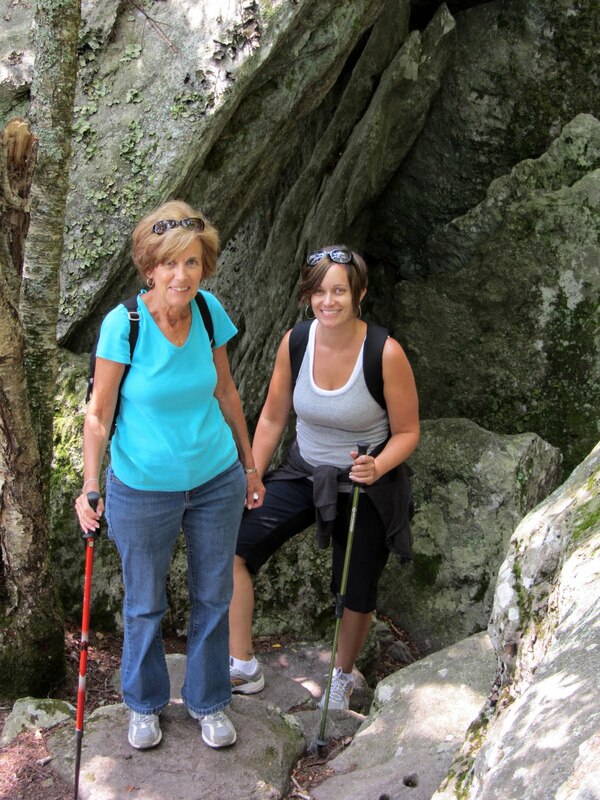 BLOWING ROCK, North Carolina — Stretching 13.5 miles parallel to the Blue Ridge Parkway, the Tanawha Trail winds around Grandfather Mountain to offer a scenic and challenging hike. 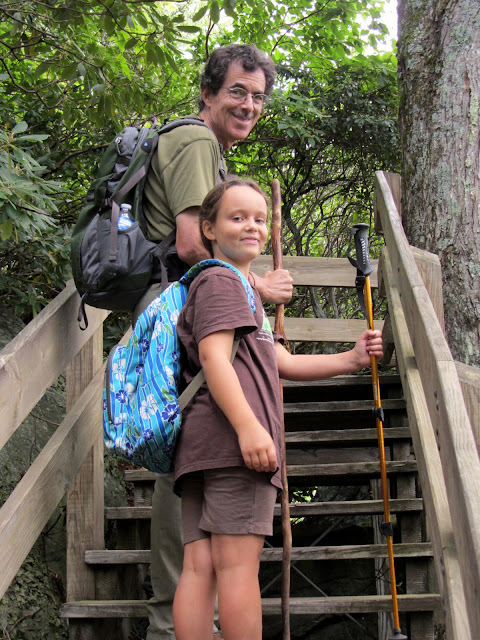 Today we explored a two-mile section of the trail from Stack Rock to the Wilson Creek Overlook. Though short in distance, those up-and-down two miles took us almost four hours to traverse. This section of the trail snakes under the Linn Cove Viaduct, the most controversial and costly section of the Blue Ridge Parkway. Construction on the 469-mile parkway began in 1935. By 1967, all was complete except for the 7.5 miles through Linn Cove, one of North Carolina's most sensitive biological environments. National Park Service landscape architects and Federal Highway Administration engineers agreed that the road should be elevated on bridges where possible to eliminate massive cuts and fills. After considerable wrangling and innovative engineering, a design was finally agreed upon that would integrate prefabricated structural elements with a progressive placement technique to minimize impact on the sensitive ecosystems. Workers, materials and machines would be moved only on completed sections of the bridge as construction proceeded. 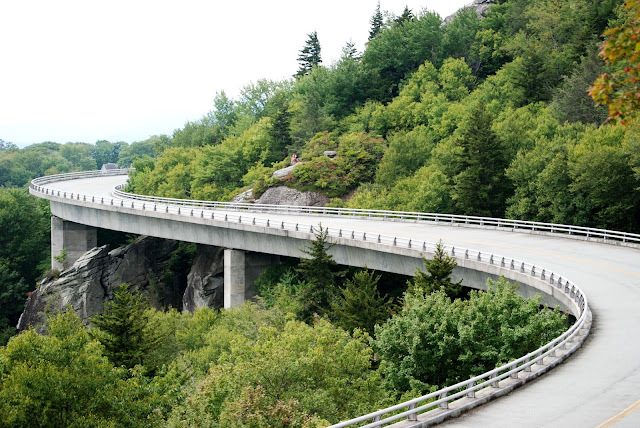 Lack of funding delayed construction until 1979, and the viaduct was finally completed in 1983, filling in the missing link of the Blue Ridge Parkway after almost 50 years. Like the viaduct, the Tanawha Trail was built in a manner that would preserve its fragile environment. 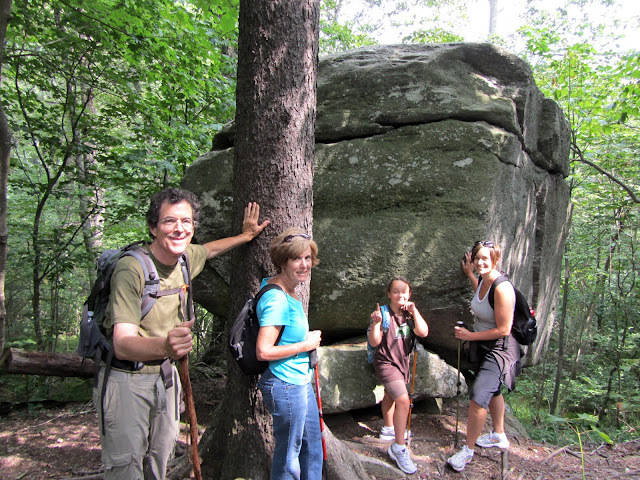 Intricate but natural-looking stone stairways carry hikers through jumbles of massive boulders. Occasionally stopping to search for letterboxes, we scrambled up and down rock treadways, through small streams, and under granite cliffs, as giant hemlocks loomed overhead. More than $750,000 was spent in the construction of this demanding trail. 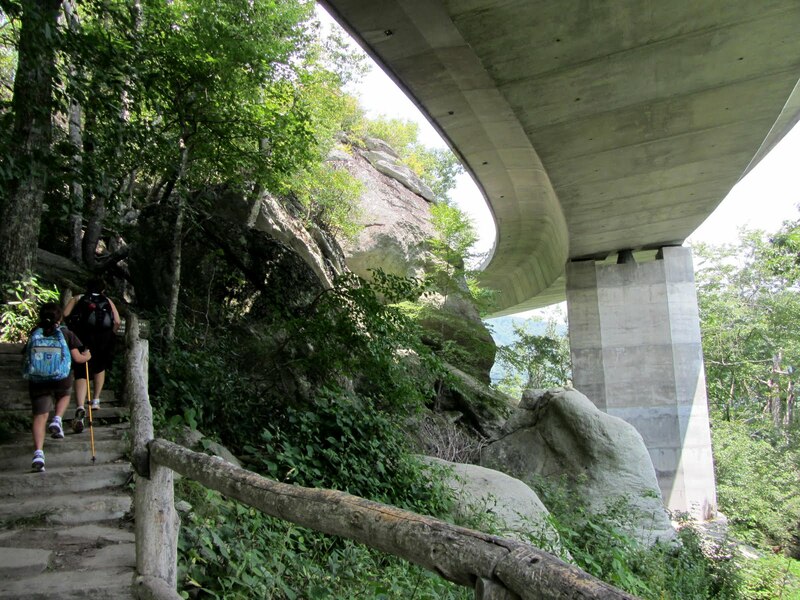 Wooden bridges placed to keep hikers away from delicate vegetation were built off-site and lowered into place by helicopters to reduce the damaging consequences of construction. By the end of our hike, we all felt we had achieved a personal accomplishment. And never a whine was heard, not even from a tired eight-year-old, who had taken about 50% more steps than the rest of us.